Wormwood tea is made from an infusion of fresh or dried leaves helps digestion, especially before heavy meals that may cause gas and bloating. Classic spring tonic and treatment for pinworms. Cautions: Not for long term use. Wormwood tea should not be taken for longer than 3 consecutive weeks. 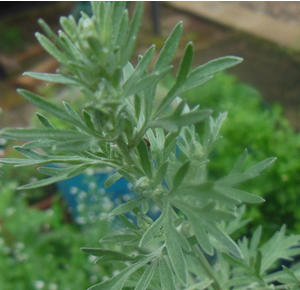 Wormwood should always be used in dried form for teas which contain little if any thujone. The bitter principle in wormwood is not toxic. Wormwood is a classic dewormer, but should not be used for long periods, or at all in animals with liver disease. Recipe Instructions: Herbal Tea : Wormwood should only be steeped five minutes because of the bitter taste. Drink a small cup before meals to aid digestion, or as an occasional energy tonic. Wormwood should be taken unsweetened to have the best effect.